Let me show you around Prague, Czech Republic, my hometown. Contributing to A Good Run gives me yet another opportunity to observe the entire city from a different perspective. 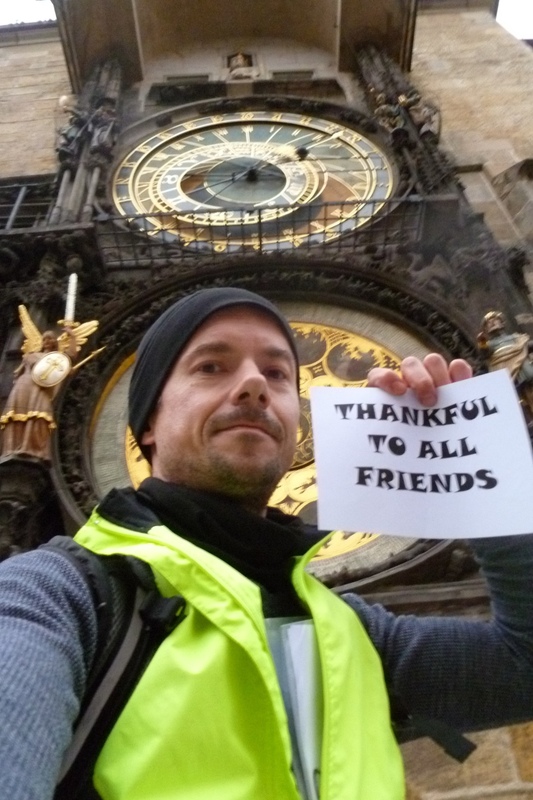 Recently, I started the Running Tours Prague project for runners from all over the world who come to Prague on vacation or business. But today, this is special and new. Rather than going for a long run, this one will include more contemplation. I won’t visit all of the landmarks, but this run will include more of my personal thoughts instead. 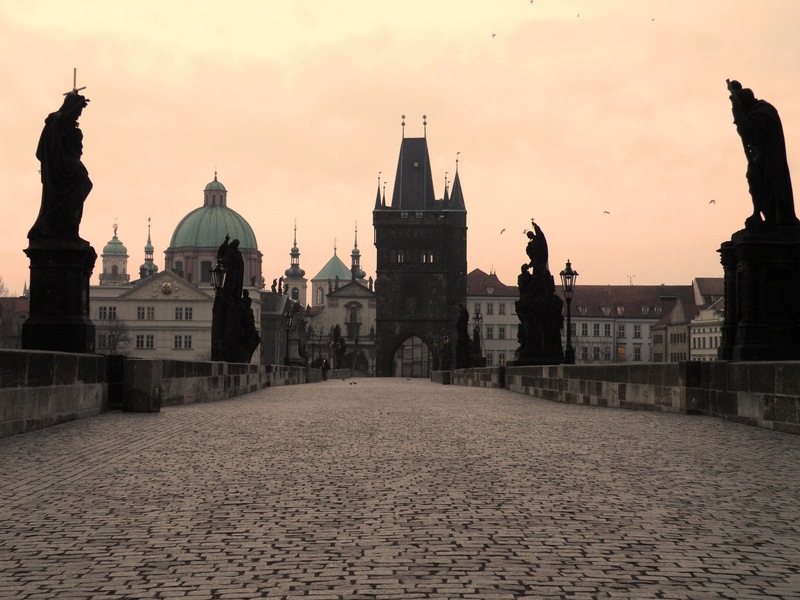 First, no one should dare miss the Charles Bridge! The bridge is so dear to all the Praguers that during our frequent floods, our major concern is always whether or not the bridge survived the flood. Having been built in the mid-14th century, the bridge (among obvious materials) includes substances of milk and vine added to the mortar used. Its more than 500 meters have survived all of the challenges of natural disasters and wars. Despite its location in the very heart of the ancient city, you can run across it without seeing anybody else, especially during early morning hours. The exceptions may be few lone travelers with cameras and a handful of runners with backpacks commuting to their workplace (an increasingly popular means of transport lately). The Vltava River provides a deep split between the left and right banks of Prague. If you set off to the west, sooner or later, you’ll make it to the castle district with its magnificent cathedral. We went the opposite direction though, as I prefer heading towards Old Town to get instantly sucked into a literal maze of middle-age lanes. Let’s get carried away by this maze of narrow streets that never continue straight, but wind through a cobweb of architecture built centuries apart, standing side by side, organically grown into one another. It’s hard to stay cool in environments like this – it’s so romantic! Speaking about matters of the heart, my parents are just the right people to thank here, as my dad’s workplace (university) is just around the corner, and the same goes for my mum (library). To cut a long story short with Jirka Cupak, I thanked him here as he was the one who persuaded me along time ago to start running in the first place. The heart of the Old Town is the square where many individual routes intersect. Embraced by many picturesque houses and churches, cut through by a meridian marked distinctly with a bronze sheet in a pavement, the square is an important place for pedestrians who happen to bump into others whom they know. When this happens, they often stop to chat and very often decide to have a drink at some place nearby. Every time you loiter around, for say 10 minutes, you inevitably meet someone you know. As beer-loving Czechs say, “Let’s have a glass of beer” (in fact, they rarely end up having just one). Even for a very committed runner, the famous astronomical clock that features a parade each hour of wooden-carved apostles and death swaying its hourglass (to name just few of its marvelous features), should be a good reason to stop for a while. At this point, in this huge informal meeting-place, I expressed gratitude to all of my friends whose ways have entwined with mine. Any direction that you go from here works. I prefer running at random. Even after 39 years of living here, I discover connections, shortcuts, or passageways that I have never taken! To let out a secret, in the low-season, you can beat the tourist crowds easily. During summers though, I occasionally play a little game of mine. I cruise the car-less cobblestone streets and at each junction, I enjoy the act of picking up the least busy road. It’s fun. It’s joy. Let me thank my little daughter Babu here for never ceasing to be sunshine of my life. She runs a bit as well. Recently, she even made me do a little workout together in the evening. I guess she was mainly trying to test out the new headlamp on her forehead! 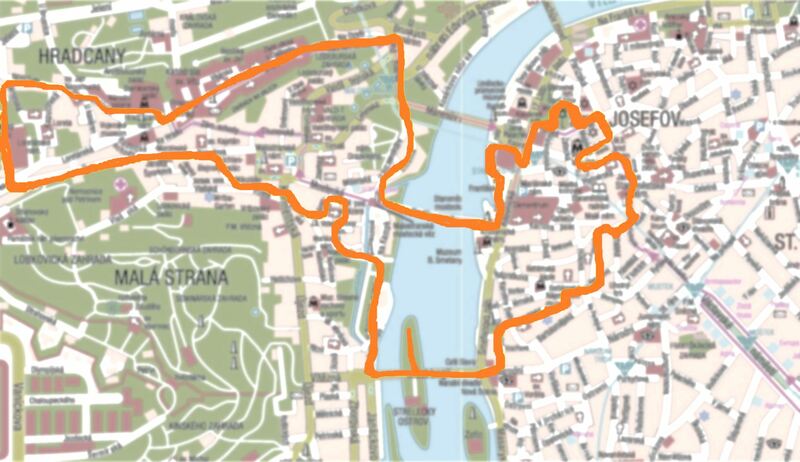 The streets of Prague are sometimes a challenge to run. As their surfaces are very often paved with cobblestones, one must mind their steps carefully. The unevenness combined with the unhappy slippery features when wet or frozen might be good ballet-training. 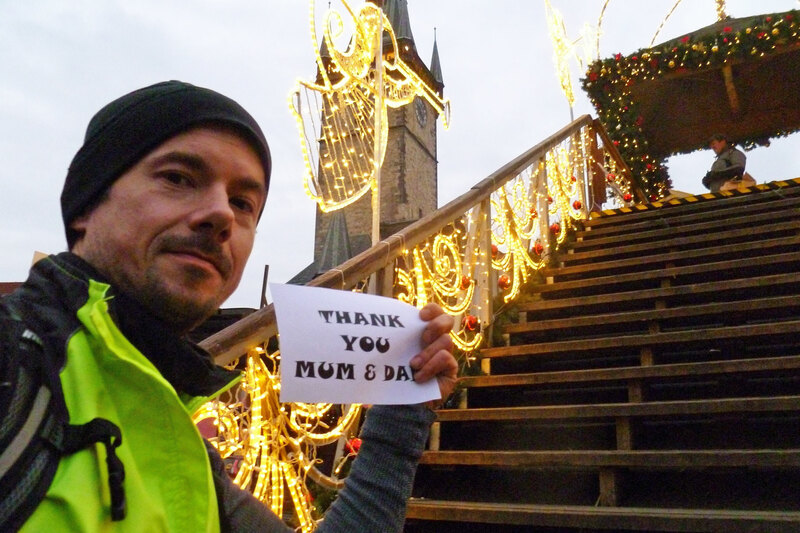 Yet, at the same time, every runner appreciates the benefits of our streets: regulations restrict most traffic out of the historical center, the town is generally very safe and the premises are all neat and clean. 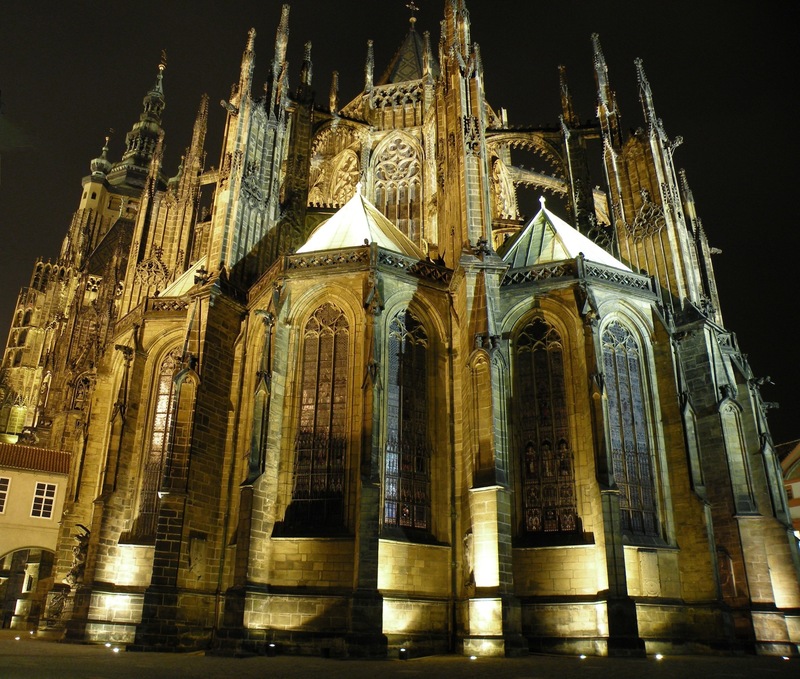 But now, the Prague Castle looms right above the rest of the historical city center. I took the opportunity to kneel down (in a manner of medieval knights) to express my gratitude to my girlfriend for, amongst many things, standing by me in so many respects. She also encouraged me to start a little business of my own, Running Tours Prague, so some day you may find yourself jogging all of these streets with me. Who knows? How about running up the hill now? It is a December evening so one can enjoy the solitude of an almost deserted downtown as we left the rush districts of Christmas shopping well behind us. It’s getting dark so soon now. It always takes me by surprise. It takes approximately 80 meters of ascent to get up to the castle. Some say that the castle is “outrageously outsized.” True. Many ruling egomaniacs of the past felt that they just could not let the inherited complex intact, but had to add something to it to immortalize themselves instead. So it grew throughout the centuries. A well-balanced cocktail of all of the architectural styles that ever existed in Europe, it is extremely easy to look at 24/7, as a smart web of impressive lights wraps around it after the sun trickles away. You won’t see many runners here. The locals prefer large parks instead and tourists stay down at river level where most of the hotels are. The tallest of the Castle’s towers invites you to climb up the stairs as do several other historical downtown towers. The 3600 view is breathtaking. What a shame to run out of camera battery before making it to the top! Speaking of rejuvenating aspects, one can jog for an extra three minutes to the western rim of the city and make it to the almost deserted “New World” corner. The overwhelming peacefulness of the tiny baroque settlement of several curved lanes makes you yearn to spend the rest of your life living right there! 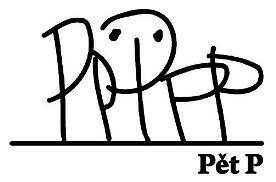 It reminds me of a Big Brothers Big Sisters branch called “Program Pet P,” whose Prague branch I used to manage ages ago. Some of the activities took place right here. Anyways, we have to be moving on, so why not employ the western wind (90% of wind comes to Prague from the West) and rush back downhill to the Vltava River bank? At Mala Strana (Lesser Quarter), heaven for artists, students and foreign embassies, we could join the locals and treat ourselves to all the leisure activities like café/bar crawling (throughout the year), Frisbee-tossing or having a riverside picnic during the summer. We still have the river to cross to finish our run. The wind is blowing pretty strong today and I feel already a bit chilly. To conclude, many traveling runners do their workouts on their own, either by running the main roads to and fro or, a wise option, by keeping to the riverside and running south using perhaps the most popular running path with the local sporting population. Halfway, they turn around and head back into the center as there are many cozy cafés along the way, some of which are housed on the upper decks of the anchored boats. Here, they can finish their course by rewarding themselves with a beer or two. Mulled wine works well in the winter. Afterwards, all should head for a hot shower which where I am going now! Before I end, I’d add my last “THANKS,” this time to all of you who read this post. 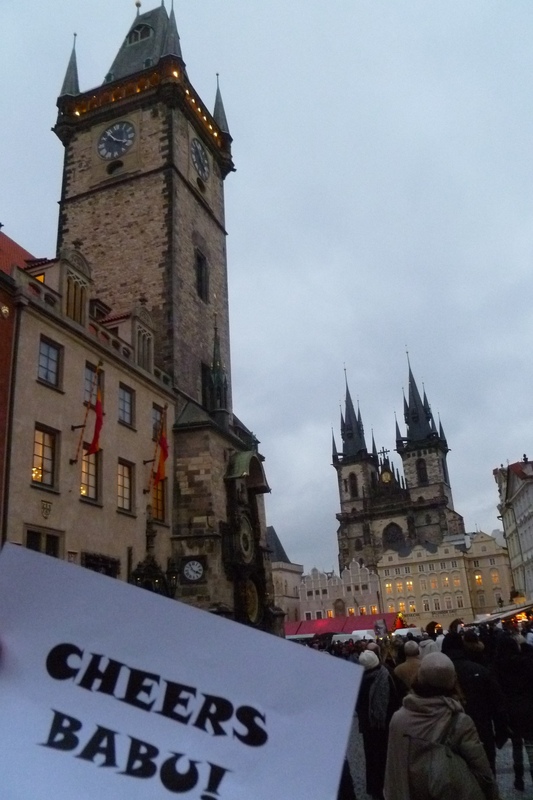 And should you come to Prague one day, I’ll be glad to show you around – on the run of course! degree is more likely to increase one’s lifetime earnings many times fold. The the fact is, people join MLM opportunities due to who introduced them.